In no other place on earth can you find such a bizarre and fascinating biodiversity, where penguins swim with dolphins and sea lions share sand with iguanas. And don’t forget the giant tortoises! 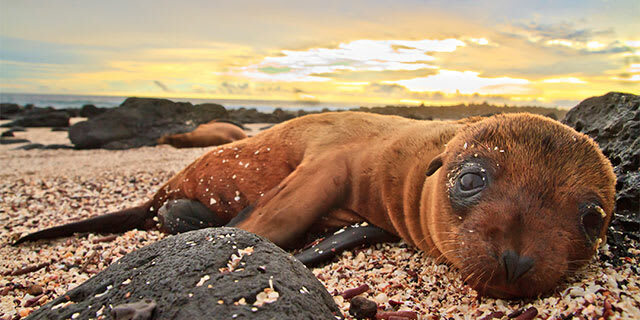 600 miles off the coast of Ecuador a hidden gem lies in wait for the adventurous traveler – the Galapagos Islands feature incredible landscapes that are just as picturesque and memorable as the wildlife. Some islands feature cloud forests and lush tropical vegetation while others feel as though they are from an alien planet, formed by volcanic activity and home to strange desert vegetation that is seemingly out of place. About half of the species on this remote volcanic archipelago are found nowhere else on earth. Travel in the footsteps of Charles Darwin on an island safari and experience this one-of-a-kind place for yourself! 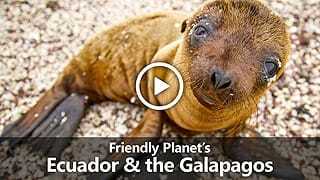 Already booked on one of our packages to the Galapagos? See everything you need to know before you go. 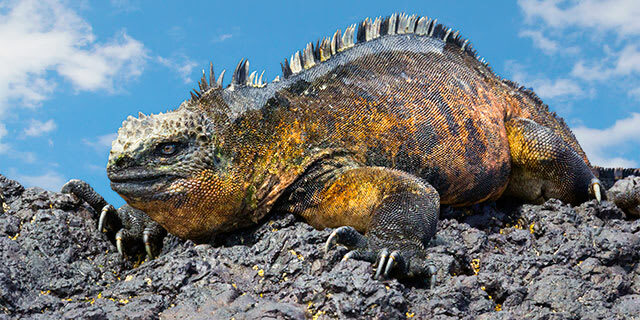 In addition to the entry requirements for Ecuador, all visitors to the Galapagos must obtain a INGALA Tourist Control Card (TCT), which allows for tourist stays up to 90 days. This card is $20 and purchased upon arrival, then turned in upon departure. All tourists must also pay a Galapagos National Park entrance fee, which is $100 for most foreign tourists, or $50 for children under 12. Booked on one of our packages with Scheduled Dates? We will obtain your Tourist Control Card (TCT), and the TCT fee and park entry fee are both included in your package price. Visitors to the Galapagos are now required to present proof of medical and emergency travel insurance, or you may be denied entry. Our comprehensive travel protection plan fulfills this requirement, and is available for purchase before or with your final payment. NOTE: As of Oct 11, 2018, the Ecuadorian government has postponed this requirement until further notice. The Galapagos Islands are located on the equator. The tropical heat, however, is tempered by Pacific breezes. There are two seasons in the islands: the rainy, hot season from December to June when humidity is high and average temperatures are in the 80s F (26°-30° C). There may be occasional showers, but the days are generally hot and sunny. From June to November, you can expect cool winds, occasionally bringing with them a light misty-type drizzle called "garúa." Temperatures average in the 70s F (20°-24° C) during the day and lower at night. For travel in the Galapagos, clothing ranges from informal to very informal. Essentials include sneakers, shorts, long- and short-sleeve lightweight shirts, bathing suit, a wide-brimmed hat, long pants, and a wind breaker or light jacket for evenings. Be sure to bring sunscreen, sunglasses and lots of film. Most walking ashore is over rocky lava terrain. Tennis shoes, sneakers, or walking shoes with rubber soles are strongly recommended. Tip 10% of the bill unless a service fee is included, additional small amounts are appreciated. Round up fare for taxi drivers. It is customary to tip the crew and guides on boat tours separately and depends on your experience with the service. A general guideline is $10/$15 USD per day, per traveler. Shopping is limited in the Galapagos Islands. The best place to purchase the quintessential “Galapagos Island” souvenir gear is at the Charles Darwin Research Station which offers high quality items and proceeds benefit the preservation efforts. 110 volts. We recommend that you bring an adapter/converter along with you as not all hotels will have 110 volt (A&B plugs) outlets. View more information about electrical standards around the world. In 1873 British Captain James Colnett set up a post office barrel in the Galapagos Islands! Originally whalers would drop their letters in the barrel on their way out to sea and the mail was relayed to their families back home. Today, tourists often leave notes in the barrel! The penguins who live in The Galapagos are the only ones that make their home north of the equator – making them the only tropical penguins on Earth! There were once up to 15 different subspecies of giant tortoises on the island, of which 10 still remain today. 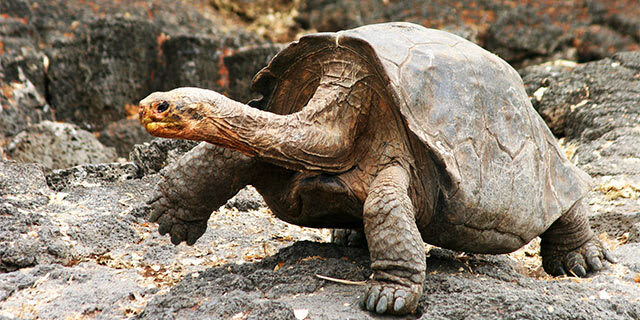 These giant tortoises may live up to 150 years. The islands were originally known as the Enchanted Islands due to the strong, shifting currents that made navigation difficult. What are the Dos and Don’ts of Environmentally friendly travel to the Galapagos Islands? Pack plenty of extra space on your camera card! You’ll want to take a LOT of photos! Take food or plants to the islands. This might jeopardize the ecosystem. Feed or touch the animals – no matter how friendly they seem! Skip the detailed information provided by your guide – their expertise will enrich your experience! Take “souvenirs” of rocks, plants, or other natural material. As a note, smoking is prohibited in the national park areas. Snorkeling gear is included on our tours. Check out our blog for our latest articles on the Galapagos.